Home » Steal vs. Steel: What’s the Difference? English words that mean the same thing but have different meanings are homophones. There are many homophones in English, and it can be difficult to tell them all apart. Even experienced writers sometimes make embarrassing mistakes. Two homophones, steal and steel, are particularly easy to misuse. There is only one letter’s difference in their spelling, but these words are not interchangeable in any context. Continue reading to discover whether you actually mean steel or steal. What is the Difference Between Steal and Steel? In this article, I will compare steal vs. steel. I will use each word in a sentence to demonstrate its proper context and meaning. Plus, I will tell you a practical memory tool to help decide whether to use steal or steel in your writing. What does steal mean? Steal is a verb with multiple senses. In one sense, it means to take something that belongs to someone else. “Thou shalt not steal” is one of the Biblical Ten Commandments. Robin Hood decided to steal from the rich and give to the poor. Steal can also mean to sneak, as when one avoids detection through stealthy means. While Grandpa is asleep, I will steal down to his wine cellar and find us something to drink. Sometimes, steal is used as a noun, where it is a synonym of bargain in that word’s noun sense. “A queen sized pillow top mattress for only $300 is a steal,” the wife said to her husband. What does steel mean? Steel can be a noun or a verb. As a noun, it refers to a type of metal that is an alloy of iron and carbon. Steel has many uses and is one of the most common metals in the industrialized world, finding its way into such varied applications as kitchenware, medical equipment, and building construction. High chromium stainless steel is resistant to corrosion and does not warp easily, making it well-suited to environments where regular sterilization is necessary. The new bridge is reinforced with steel girders. Steel is also a verb, where it means to mentally prepare. He steeled himself for the oncoming verbal assault. 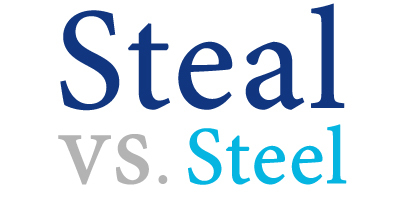 Now that we are all clear on each word’s meaning, let’s go over a helpful memory tool to remember steel vs. steal. As a noun, steal is another word for a bargain. You can remember to use steal in this context since it is spelled with an A, like its synonym deal. As a verb, steal means to take something that belongs to someone else. If you are very hungry but have no money, you might be tempted to steal a meal. You can use the same trick as above with the words steal and meal. Steel is a type of common metal alloy. Steel is everywhere, including cabling. Steel cable might come on a reel. Steel and reel both have a double E, so remembering to use steel in this context should be easy, as well. Is it steal or steel? Although these two words sound the same, their meanings are completely and totally different. As a verb, steal means to take something that belongs to someone else. As a noun, a steal is a great bargain. Steel is a noun that refers to a useful metal alloy. It is also a verb—to steel oneself is to mentally prepare for something. Using the memory tricks in the previous section, you can be sure to always use steal and steel in the appropriate context. If you still need help, you can refer back to this article for a refresher. 1 What is the Difference Between Steal and Steel?